This week the tournament is going to be on Sunday at 21:30 GMT and there will be the usual prizes for the final table. PokerStars is going to give to all players that make the final table a ticket for the Sunday 1/4 Million, that will be credited to their account in the following week. If I don't list the blog after a few days, feel free to remove andrecoimbra.com from your blogroll . 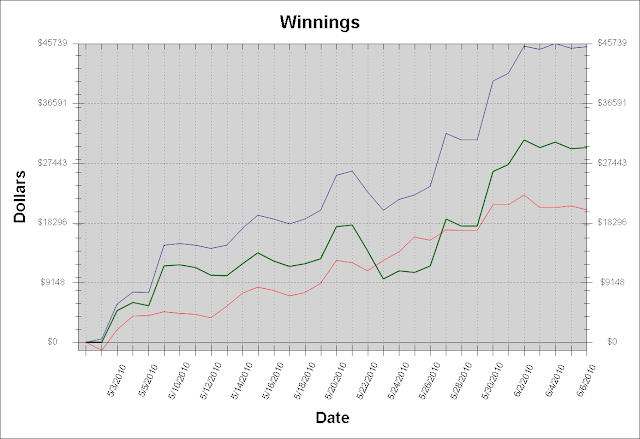 The last 3 days I didn't play much, so the graphic hasn't changed much. I was trying to fix my sleeping schedule so that I can sleep and wake up a bit earlier, that way I will profit at maximum of the best hours to play. I thought that I would only lose a day trying to do this, but in the end I lost two. I hate waking up at the sound of an alarm, I always end up being less concentrated when I play and if I'm not at my best I can't win, because the edges are very small. I also planned my working schedule. It's a bit "trial and error" style, I'm just experimenting, taking notes and making small changes. It's been quite some time that I've been playing Poker as a full-time occupation, but the working schedule is something that has changed throughout the months and it's something I always think about. 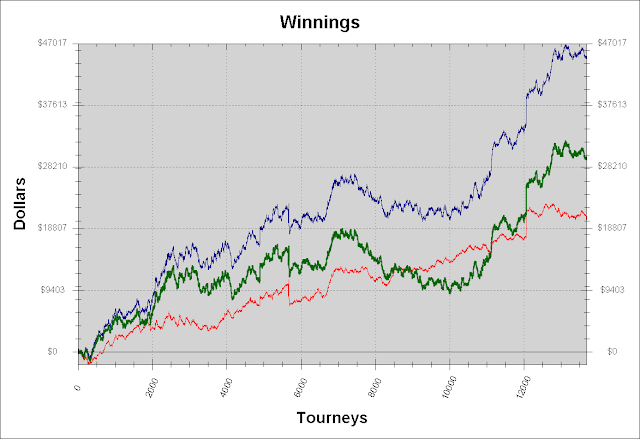 Soon I will start playing some satellites of $200 and $400. It's possible that they will delay me a bit on the challenge, but it's a step I will have to take eventually and I feel capable of doing it at the moment. On Sunday the plan is to play all day and as for the mtts I will play the Sunday Warmup and the 1st tournament of the Summer League of andrecoimbra.com. Day 32 went well, I think that if I don't have a very big downswing, I will manage to finish the challenge next week. 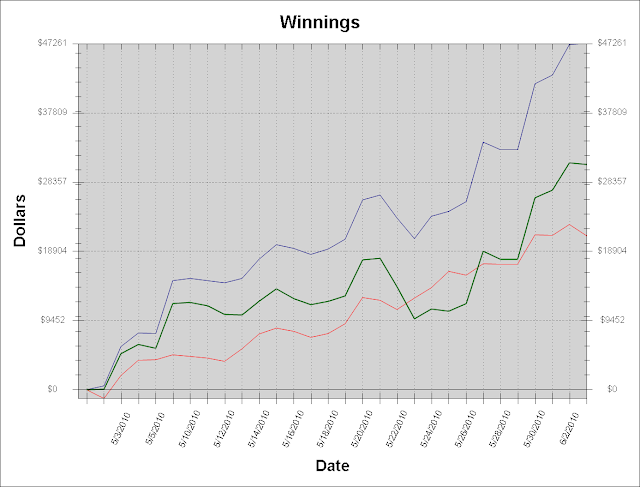 I will try to play a bit more this month, since many of the regular players are trying to win bracelets. As you have asked, I put the two graphics! On Monday, I spent my time reviewing the details of the Summer League of andrecoimbra.com, creating the tournaments, writing posts on my blog and inviting the pros. I believe we are good to go! As for Magic: The Gathering, I didn't play Pro Tour San Juan and it was the first time that I missed a Pro Tour while being qualified for it. To attend Pro Tour San Juan I would waste at least two weeks, because I need to adjust to the different time zone when I go and when I come back. Considering what I make at this moment playing Poker, I thought it would be silly to go. I was happy when I checked the coverage and I saw that PV won, cause he is an excellent player (much more than I am) and he is one of the people that dedicate most of all to the game. I believe he deserved the victory! Now back to what really interests us... The Challenge! I won't put a graphic in this post since I don't usually put them in the posts of the days that I don't play, but next time I will put both of the graphics as you asked in the comments. I'm already past the middle of the time and I have a profit of $43K, so I'm only missing $17 to complete the challenge, but I'm confident that I will be able to make it before the deadline. This month I learnt A LOT about Hyper-Turbos and I was able to determine the number of tables that is best for me to play, which is great! The blog tournaments were created for the readers of my blog and have had a great success so far. Now is the time to reward the regular readers of the blog as well, by creating the "Summer league of andrecoimbra.com". -The tournament is always on Sundays at 21:30 GMT. -The buy-in is always $5,5. -The format is always NL Hold'em. -Whoever makes the final table receives a ticket for the Sunday 1/4 Million that will be credited to their account by Pokerstars during the week following my blog tournament. Whenever someone makes a money finish in the tournament, they also will earn a number of points equal to their prize. If they make it to the final table, they will earn an additional 11 points. 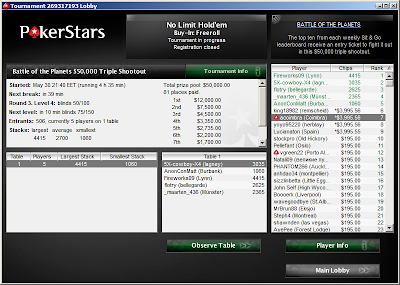 These tickets can be used on PokerStars in any tournament with the corresponding buy-in. In case of a draw, the 1st criteria of a tie breaker will be the best result at a tournament (# of awarded points) and if there is still a draw, the 2nd criteria will be who got that result more recently. The games were slightly better than the last Sundays, I guess many of the regular players attended the WSOP... The day went well concerning the huper-turbos, I didn't make it itm at the turbo takedown nor at the sunday warmup, but I made it to the final table of the monthly Triple Shootout of the Battle of the Planets. We made a nine way chop and got 4k each! 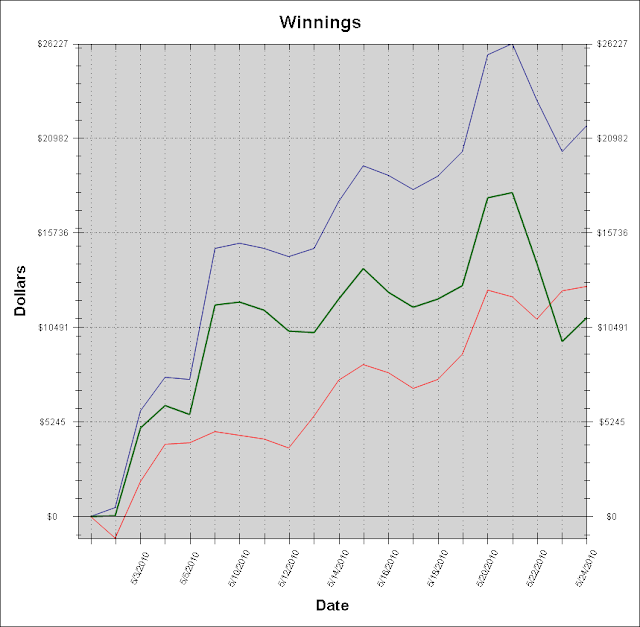 I took a break on Friday and Saturday and I only played a freeroll on Saturday but nothing special happened. It was good to have two days without thinking about poker, without thinking about the challenge, without thinking at all! Sunday though was the busiest day of the month for me, and I was hoping it would go well for a change! That day started well, then it got a bit worse, but it didn't make a big impact on the results of the challenge. On the following day I couldn't play, cause I had already been playing many days in a row and I was starting to feel tired. 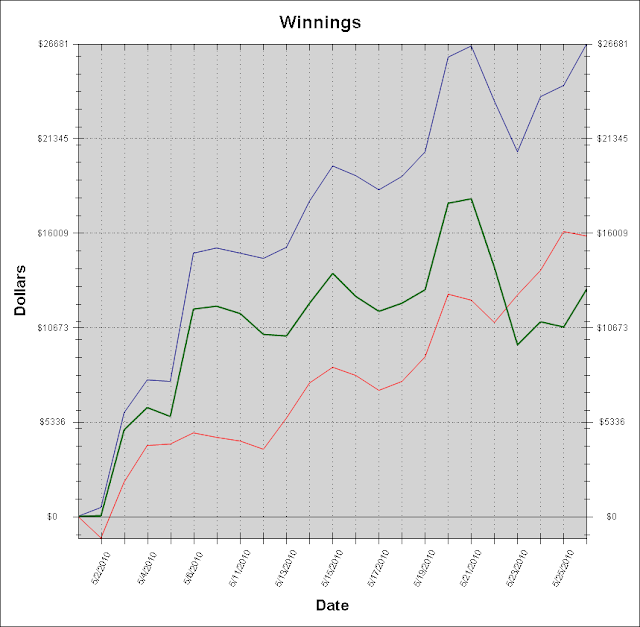 Since it was the last weekend of the month, there was the freeroll of GoldStar+ on Saturday and the turbo takedown on Sunday, the battle of the planets and the usual tournaments, so I had to play during the weekend. I will put the graphic to show the results according to tournaments and not days, I guess there are a lot of people interested in seeing what is happening at almost 10000 tournaments! You can tell me which graphic you prefer. Day 25 went really well and I got back on pace. I believe it was really good to take the number of tables down to 20-24, so I will maintain this number. I could stop playing until the end of the month, but I prefer to try to finish the challenge some days earlier next month because in the beginning of July I have to go to Las Vegas to play the WSOP main event. There was an update of table ninja, where they tried to correct the problem of new tables opening on top of the ones we were already playing. They solved 90% of the problem, but it continues to have some flaws... We have to click on the table so that it disappears and the mouse gets away from its place. In any case, it helps a lot. Since I get the same questions from different people quite often, I decided to make a section with the most frequently asked questions and their answers. A: Yes, I buy $t. I charge $1 for exchanging up to t$530. If you are interested, iniciate an exchange and send me a mail with the information. Ex. : "sn: kidpoker3, t$215, $214". I decided to start playing less tables at a time and only play 20 on the normal days and 24 when the games were exceptionally good. This allowed me to get less tired and play better, since the main reason why I was feeling tired was coming from the pressure of having to play quickly the current hand cause I had the next one already waiting. I had been playing less hours per day, but since I was going to play every day until the end of the month, I can't play too many hours. On the 24th day there was a break in my downswing and I went back to the point I was 4 days ago. For some weeks I couldn't sleep well, because there was some light coming in my room and I couldn't control it. I decided to try to sleep in a darker room of the house and after weeks of waking up with undereye circles, I finally had one good night of sleep! 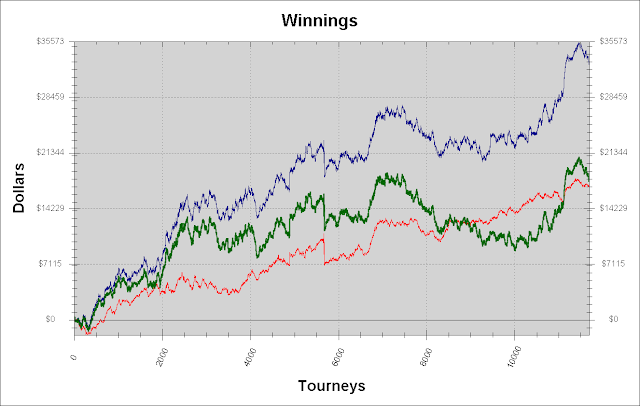 On day 23 I played only a few tables at a time, since there weren't many to play, but it was interesting that I was quite awake and I could experiment some new plays. 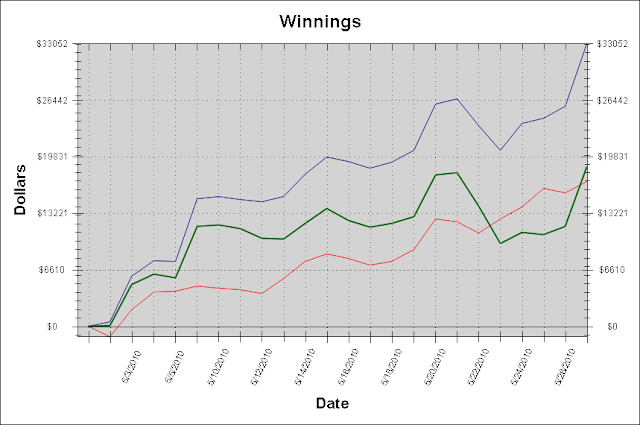 The biggest part of my plays worked and it was definately a profitable day from an educational point of view. The results were quite poor though, but it didn't affect me at all because there is always a next day when I can play and continue for the long run! A problem with the hyper-turbos was that the number of cheaters that started to appear, and the truth is that the game is favorable for that. Fortunately they are all caught and the money is returned to whoever it belongs to. I wasn't going to count the money that was returned to me in the graphic of the month since they only returned to me $350 this month, but on the 23rd day of my challenge they returned to me another $1450 which makes a total of $1.8k, so I feel obligated to take it into account. 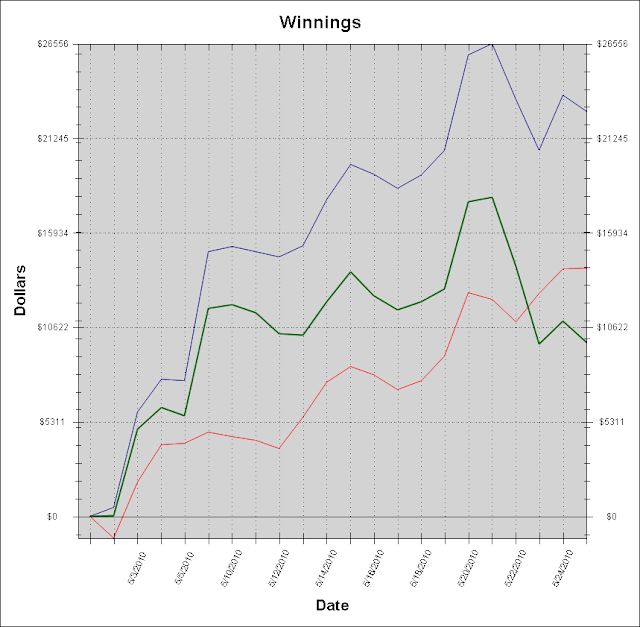 This money should appear on the green line and not on the blue one since it wasn't money from rakeback, but money that I should have won playing. The easiest way to solve this problem was to make the money appear in my database as a bonus. The bad run continued and I finished the 22nd day behind the pace. I neglected a bit the number of hours I should play and up to that point I had only played 108 hours in May, but I was going to play 52 hours more until the end of the month to compensae. Strangely, at the point where I was behind the pace of the challenge, I started feeling again that inner flame that makes us go on in life and I was more motivated than ever to work! My biggest problem was the number of tables to play, I think it should be between 16 and 24, but I don't know what is the best thing to do. My criteria to play was to have at least 12 tables running, so as to guarantee 100 tournaments per hour, but since I would have to play more hours than normal during that week, maybe I would have to take that number down to 8 or 9. 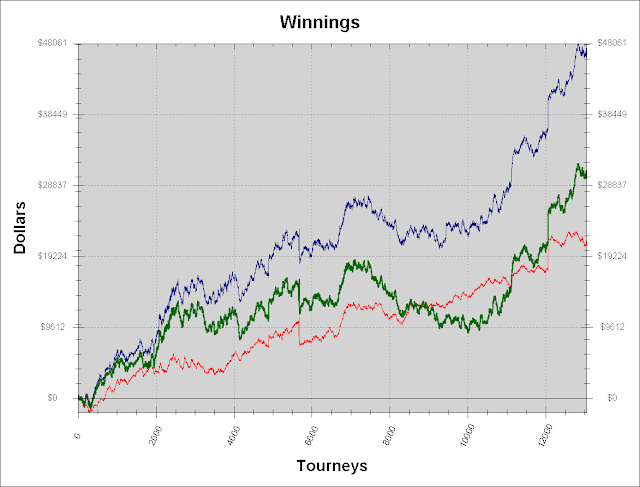 Sunday Warmup was a normal tournament and at the tournament of my blog I almost made it to the final table!